JUMLA, Jan 29: The much-hyped Raralihi Drinking Water Project of Tila Rural Municipality-1, which started five years ago, has been stalled halfway due to the negligence of the consumers' committee. 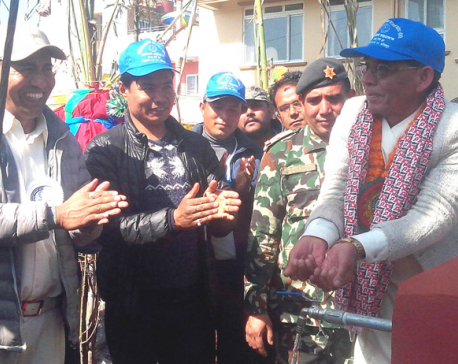 During the announcement of the project, locals were assured that they would have drinking water taps in all of their homes after five years. However, not even half of the project has been completed so far. According to Drinking Water and Cleanliness Sub-division Office, Jumla (DWSSO), lack of concern from the consumers' committee has delayed the project. The pipes which were laid for the drinking water project have been stolen in various parts. Due to the carelessness of the committee, neither the consumers have been able to get drinking water nor have the millions of rupees poured by the government for the project been properly utilized, informed Tanka Sodari, chief of DWSSO. According to him, not just the locals but even the DWSSSO is not satisfied with the work of the committee. "We had introduced this project with the aim of benefiting 223 households of the then Raralihi VDC within five years. We are about to meet the deadline but the project is unlikely to get completed anytime soon," Sodari said. As the largest drinking water project of Tila Rural Municipality has been messed up, locals here are greatly disappointed. They keep pressurizing the committee to provide them with clean drinking water but their pleas often fall into a deaf ear. Chief of DWSSSO Sodari claimed that the design of the project itself was wrong. The irresponsibility and negligence of the committee has frozen the budget sanctioned by the government twice. In the fiscal year 2015/16, a total budget of Rs 6.5 million allocated for the project was frozen. Similarly, in the fiscal year 2016/17, a budget of Rs 4 million was returned back as the project was heading nowhere. As informed by Sodari, in the current fiscal year, the government has provided Rs 350,000 for the project so far. The source of drinking water which was originally identified has already dried up and there are no alternatives. As per the DWSSO officials, there are still chances of completing the project on time if the project is handed over to a new committee. This project, which started in the fiscal year 2013/14, will approximately cost Rs 20 million. Irked by the sluggish work of the committee, locals have demanded completion of the project by switching to another committee. In lack of proper drinking water source, locals here are obliged to walk miles for fetching contaminated river water.